How come i not make a strawberry cake when it is in season! Every week when we go for vegetable shopping, these fresh berries, scream at us, asking us to pick few boxes home. My lil one loves the fresh jam i make with these berries. For that matter, this jam is very popular amongst our friends, last year i remember gifting them to many of them. 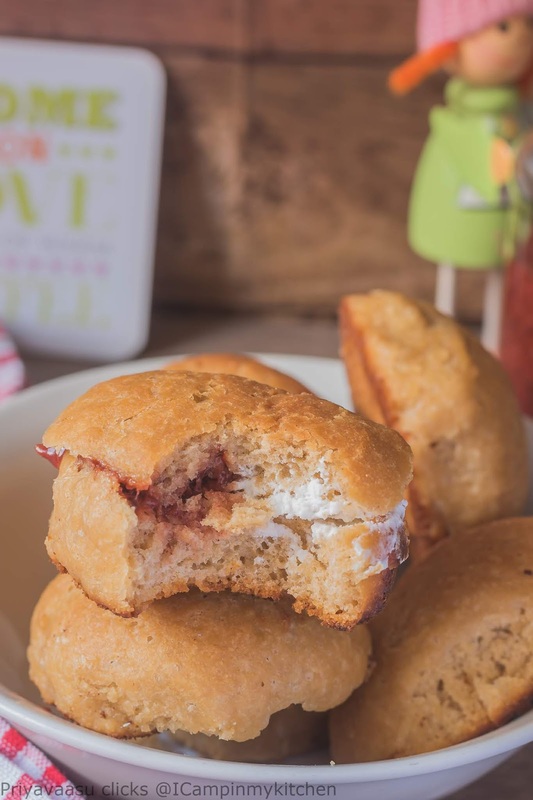 This year the first batch i made, i gave it to my non-strawberry loving friend, who loved the jam, she took some lolo buns too with them, and she messaged me saying that she loved the combination. This is the second batch of jam i made and used it all up in this cake. The recipe is adapted from my Mango cake recipe, I just replaced the mango puree with strawberry jam. One can also use fresh strawberry puree in the recipe, if using fresh puree, kindly increase the sugar to 3/4 cup. Since the jam contains enough sugar, i have added only 1/4 cup of sugar to the muffins. 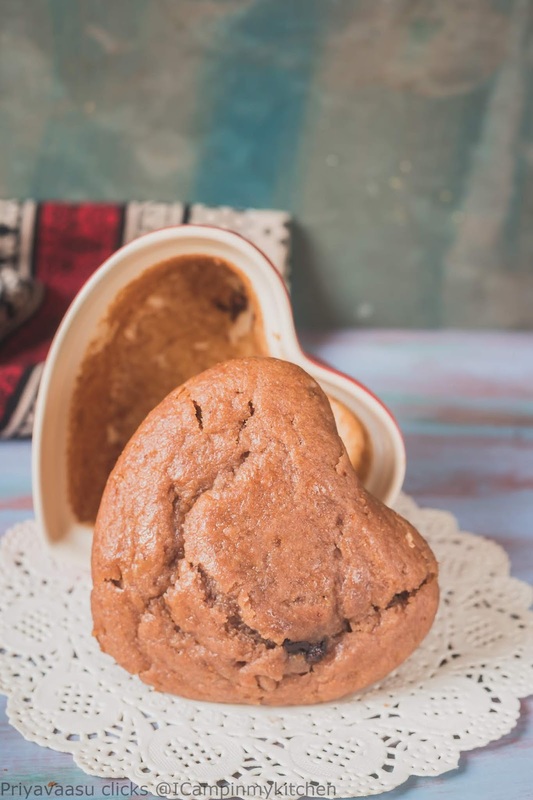 This recipe can be baked as a cake too, i baked a little batter in a bigger heart-shaped ramekin, the texture was pretty good, except it takes a lil longer time than the muffins. Preheat the oven to 180C. Line 12-hole muffin pan with liners. I got around 12 usual muffins and baked one in a slightly bigger heart-shaped ramekin. if you want to bake it all muffinss then you might get 14 normal ones. Take the strawberry jam in a wide bowl, add milk to it and whisk it smooth. Pass this mixture through a sieve, to remove the seeds of the strawberries. 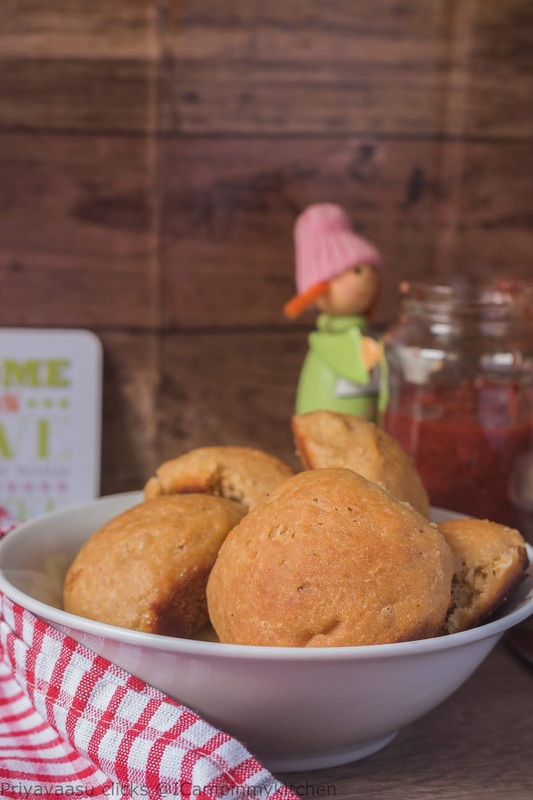 If you and your people at home, don't mind that crunchy texture of seeds in the muffins, then you can skip straining. My kids have micro sensors in their mouth, which can go 'beeeeeeppp" when they sense something unusual in their bakes. So i strained the liquid. Now to this strawberry milk, add oil and whisk smooth. In another bowl, sieve together, flour, baking powder and baking soda. To this flour mix add chocolate chips and mix. Now slowly add the dry mix in to the wet mix in 3 batches. Using a spatuala mix it in. Take care not to mix vigourously, mix in single direction. 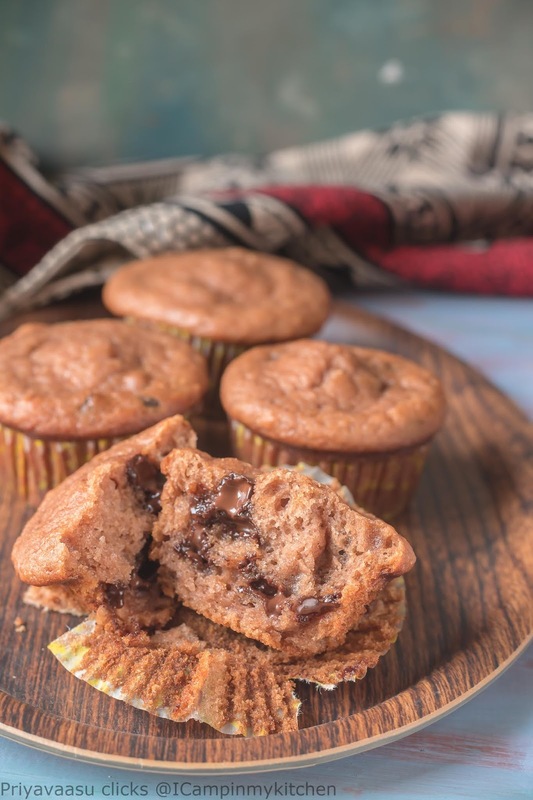 Now using an ice-cream scoop, fill each hole of the muffin pan with the prepared batter. I used my small ladle. Bake the muffins in the preheated oven for 20-25 minutes or until a skewer inserted in the middle comes out clean. Once done, remove the muffin pan from the oven, remove the muffins onto a wire rack, let it cool completely. 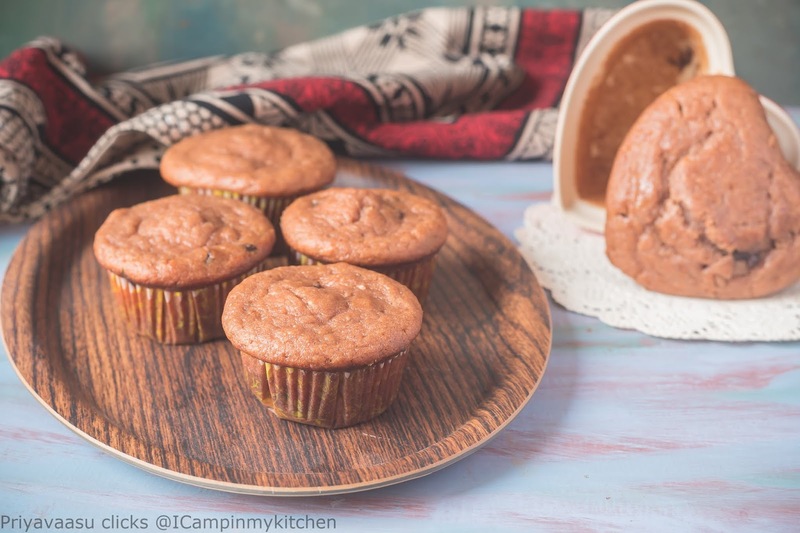 Enjoy the muffins warm along with your evening coffee or tea. 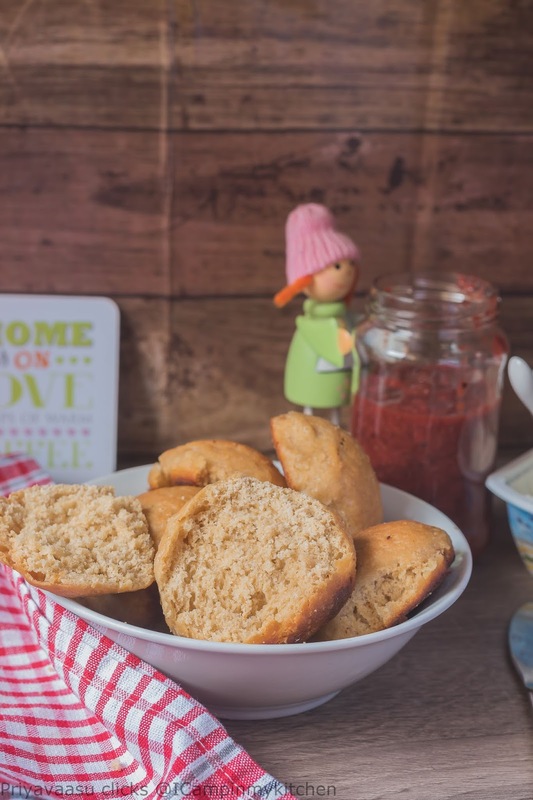 I have used my homemade strawberry jam, which already has enough sugar, so i have used only 1/4 cup sugar in this recipe. 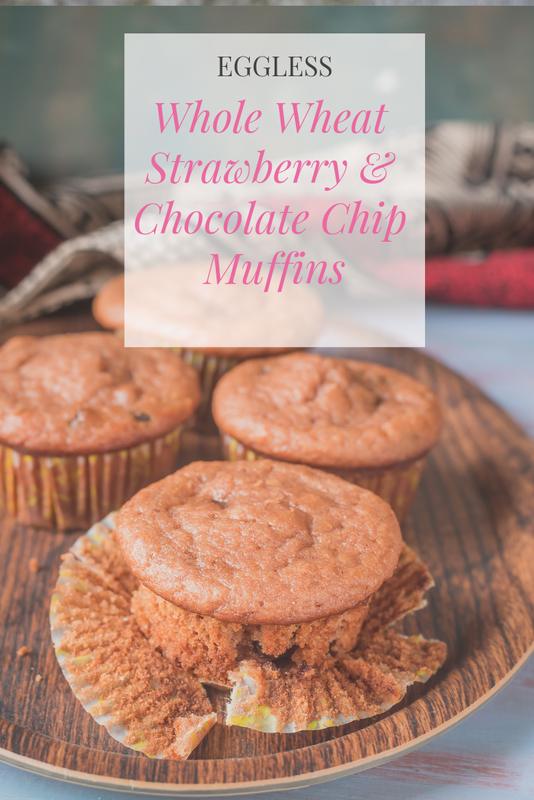 If you are going to use fresh strawberry puree, kindly use 3/4 cup of sugar for the muffins. So, here i m presenting my second attempt on my yule log as a delicious sheet cake covered with finger licking chocolate cream frosting. I baked this yesterday and added a white cream frosting, but kids wanted a chocolate on top and i didnt want to do ganache. 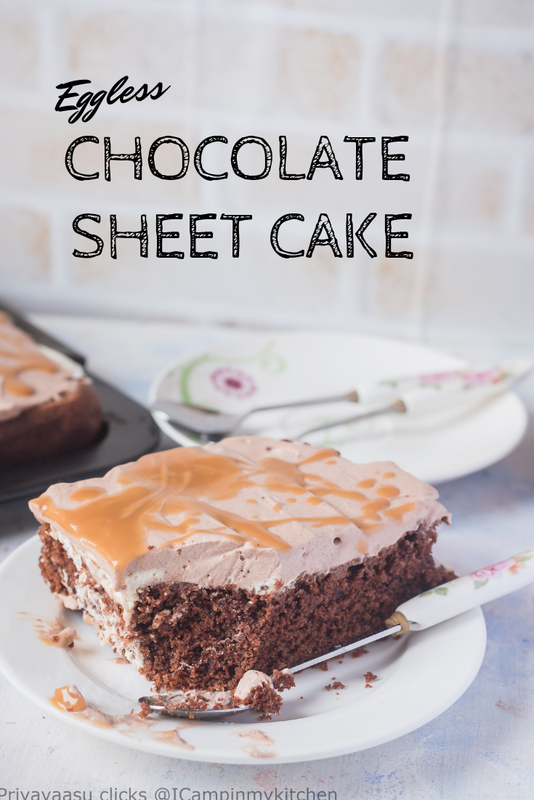 So today morning i made a chocolate whipped cream and slathered all over the sheet cake. In the mean time, the cake started losing its lower-half. The two lil monsters at home, used their fingers to dig out small squares from the sheet. Today Morning when i saw the pan, it was like some squirrel has nibbled my cake. 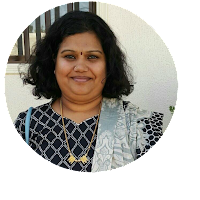 I knew i couldn't wait for long, so quickly tried to click few decent shots. The moment they knew, i m done with the photos, they cleared half the tray. 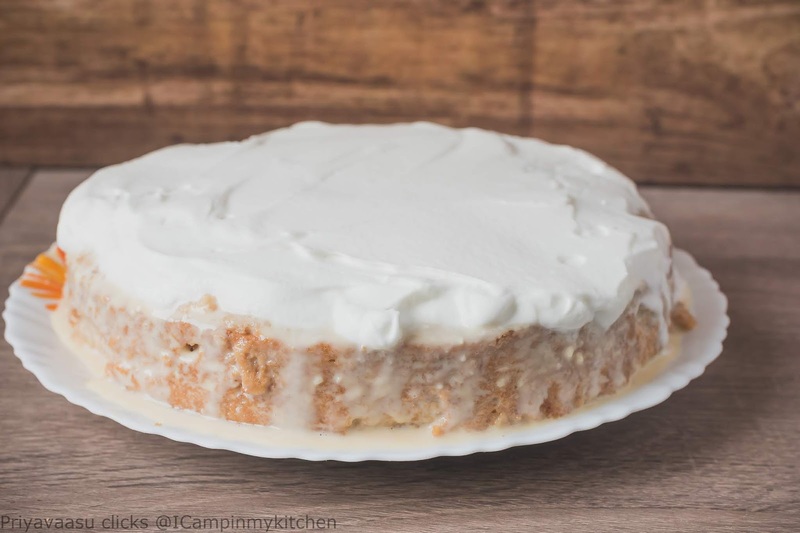 The cake has a perfect texture and the cream adds more to it. 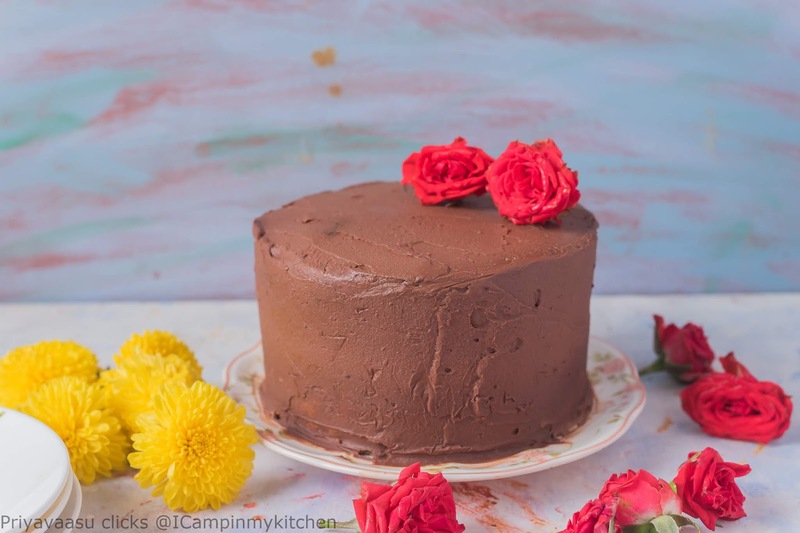 Sheet cakes are such a breeze, when you dont want to do any fancy decorations on your cake. Slap on that frosting, smoothen it and try adding some more accessories like crumbled oreo, chocolate syrup, M&M's , the options are endless. A perfect bake for parties and get togethers. Take together whipping cream and cream cheese in a wide bowl, using a electric whisk, whisk until you see soft peaks. Add cocoa powder and icing sugar and continue whipping until you get stiff peaks. Cover and refrigerate until use. Take the caramel toffee along with milk/cream in a microwave safe mug, microwave for a minute, remove and whisk it together into a smooth sryup, if the caramel is still lumpy, microwave again for 30 seconds and whisk it smooth. Make the syrup towards the end, as it thickens while resting. Preheat the oven 180C. Prepare a sheet pan with baking paper. In a large bowl, sift together flour, cocoa, baking powder and baking soda. In another bowl, add condensed milk, oil and vanilla extract, use a electric whisk and whisk them smooth. To this liquid add the flour in 3 batches, use a spatula to mix the flour into the wet ingredients. When you add the second batch, the batter would be very thick, add 1/2 cup warm water and mix. Likewise when you add the final batch of flour, add another 1/2 cup of water and mix. Do not mix vigourously, mix in single direction. Pour the batter in the preared sheet pan. Spread using the spatuala. Smoothen the top, tap twice to release any air. Bake in the preheated oven for 20 minutes or until a skewer inserted in the middle comes out clean. Remove from the oven, let it sit in the pan for 5 minutes. Then flip it on a wire rack and let it cool completely. 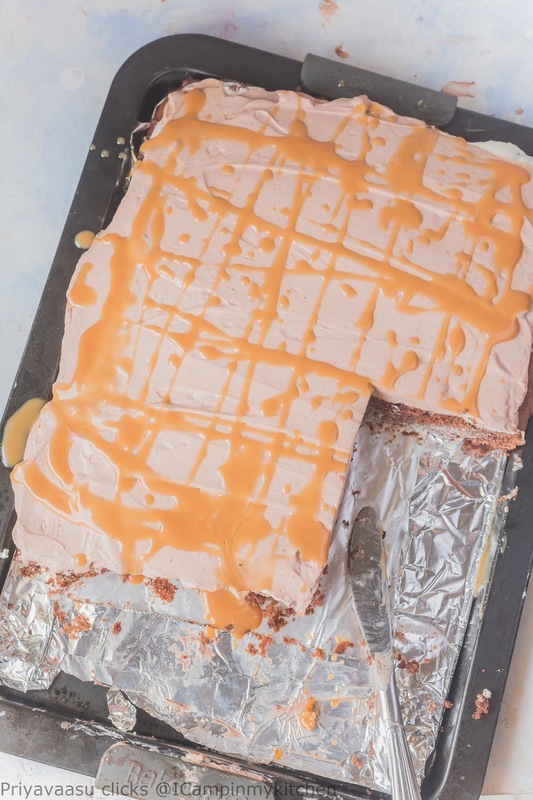 Once it cools down, return it to the sheet pan, level the cake by trimming the top, this is totally optional. 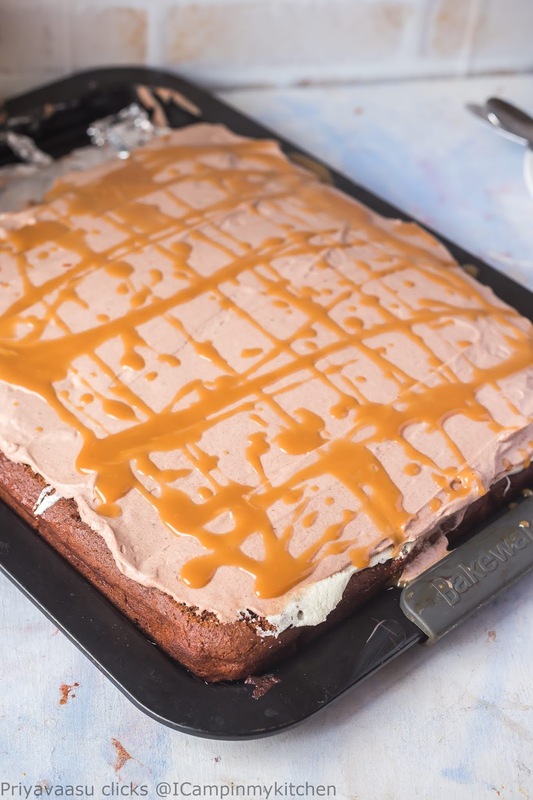 Drizzle simple syrup all over the cake. 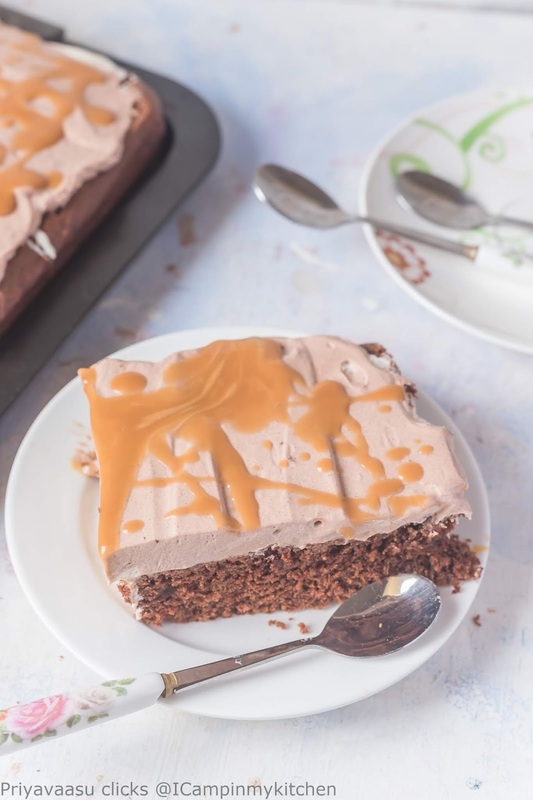 Spread the chocolate whipping cream generously, smoothen it, drizzle caramel syrup. Slice into squares and enjoy. Banana and coconut cake with chocolate ganache. 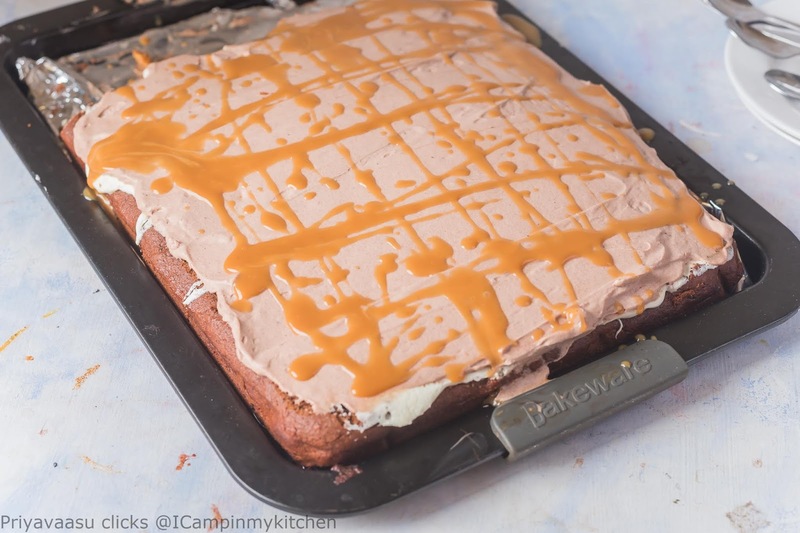 I really wanted to do a caramel and banana cake, but I wasn’t sure whether my kids would love the flavors. So I stick to their favorite chocolate. 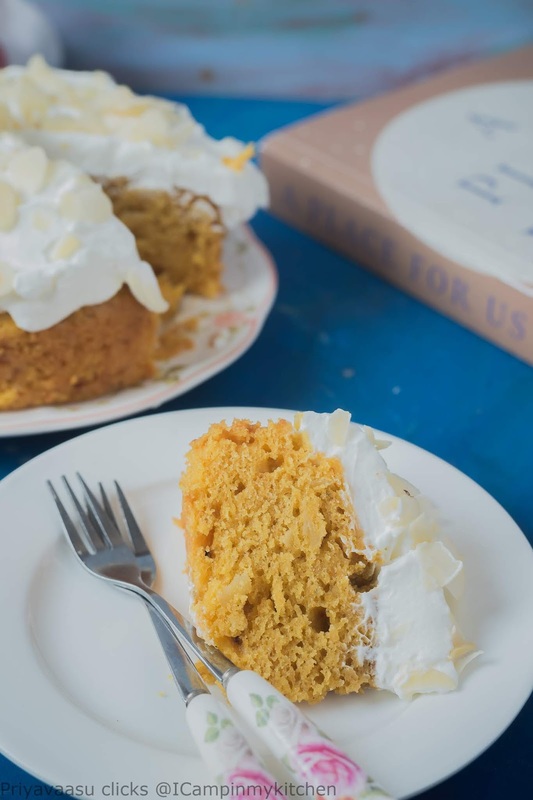 The final cake has a beautiful flavor of coconut and people didn’t know it has bananas. 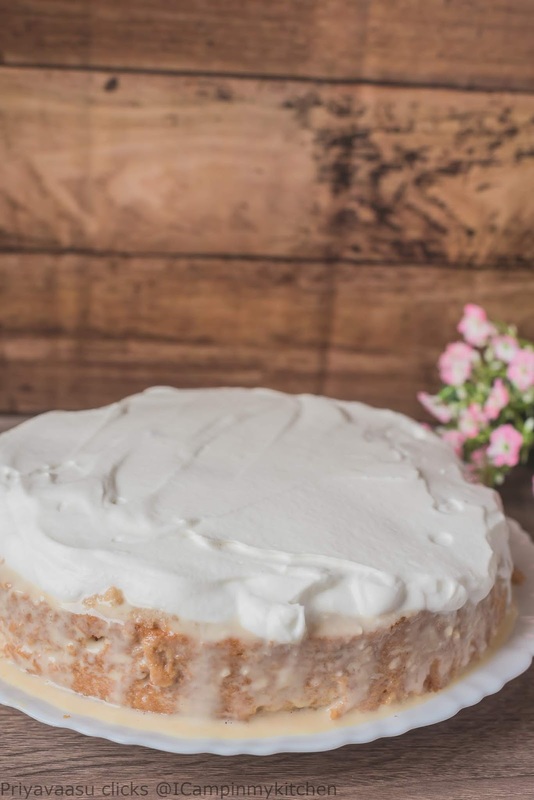 I felt it a success, many don’t like the flavor of banana in cakes, my own kids are ok with banana muffins and in quick breads which they enjoy for breakfast or a snack but when it comes to a dessert cake, they don’t want banana taste. 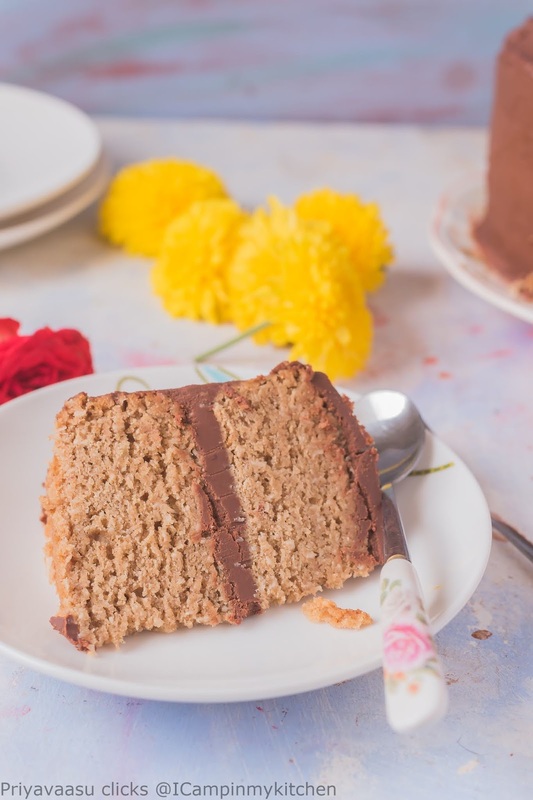 I have few friends who cannot stand the taste of ripened bananas, when one of them tasted the cake, she was amazed to know it has bananas, she even helped herself with another small slice. Sift together flour, baking powder and baking soda in a wide bowl to this add desiccated coconut, cinnamon powder and nutmeg and whisk well. In another bowl, take the roughly chopped bananas along with brown sugar and oil and using a stick blender, blend it smooth. To this now add dry flour mix in 3 batches. Using a spatula slowly mix the dry into the wet. Take care not to mix vigorously. If you feel the mixture is dry, add milk/water to this and mix. I added milk. Pour the batter in the prepared pan and bake in the preheated oven for 40-45 minutes or until a skewer inserted in the middle comes out clean. Once done, remove the cakes from the oven and let it sit in the pan for 5 minutes. Then slowly remove them from the pan and let it cool on the wire rack completely. If serving as such, serve it warm. I was planning to ganache it, so I cooled it well and cling wrapped and refrigerated it. Chop the chocolate roughly, heat the cream in a saucepan, do not boil. Pour the hot cream over the chocolate and let it sit for 2-3 minutes. Use a spatula, whisk the chocolate and cream together.if the chocolate is at room temperature then it would have beautifully melted with cream, if you find small chunks of chocolate in your ganache, then, use the microwave and heat it for 10 seconds and whisk again to smooth silky chocolate ganache. Cling wrap the ganache, let it rest until use. I usually make the ganache an hour ahead of filling/frosting the cake. Remove the cake from the refrigerator, torte the cakes. 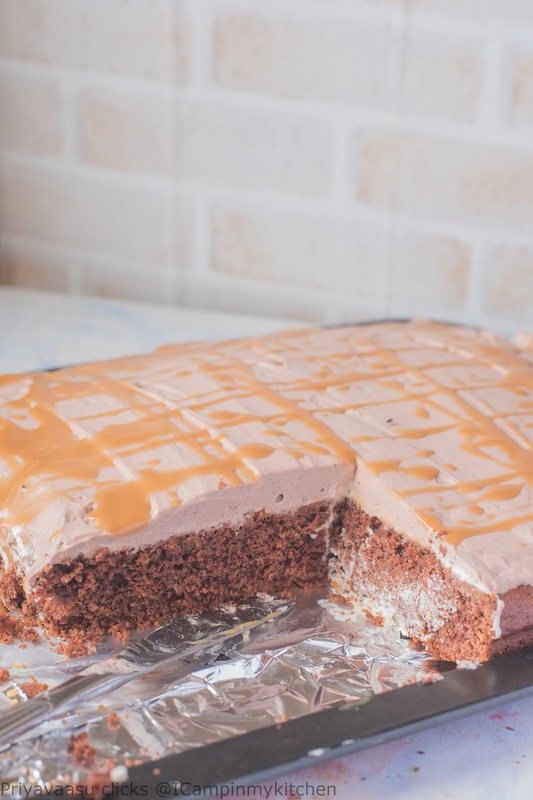 Place a cake layer on the board, brush the cake with simple syrup, fill the layer with ganache. Add the second layer of cake on top. Brush it again with syrup and fill in the ganache. 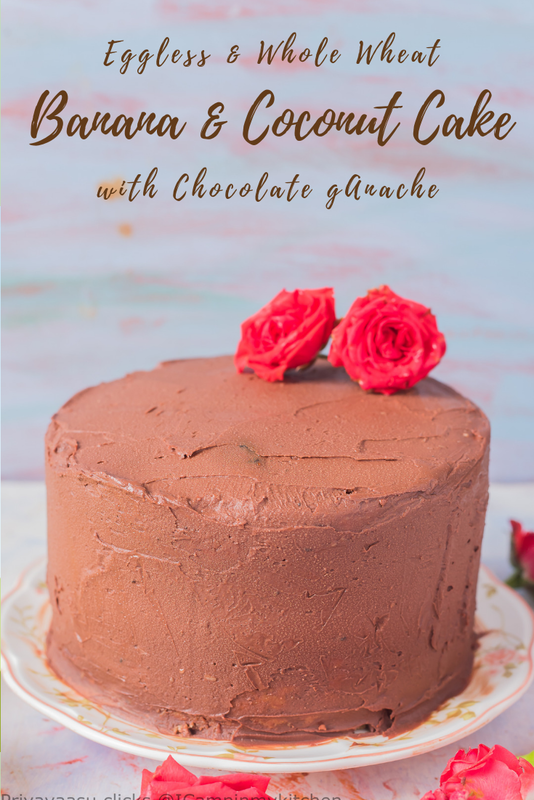 Spread The ganache to the sides of the cake. I tried by best to achieve a smooth texture. But then I making it for my folks at home, i know the flavors are great so didn’t worry much when I couldn’t get smooth ganache! Let the cake sit for 10 minutes before serving. The last week of Bake-a-thon, it is going to rain cakes here. The first cake is a luscious mango cake, spiced with cardamom,cloves and ginger. 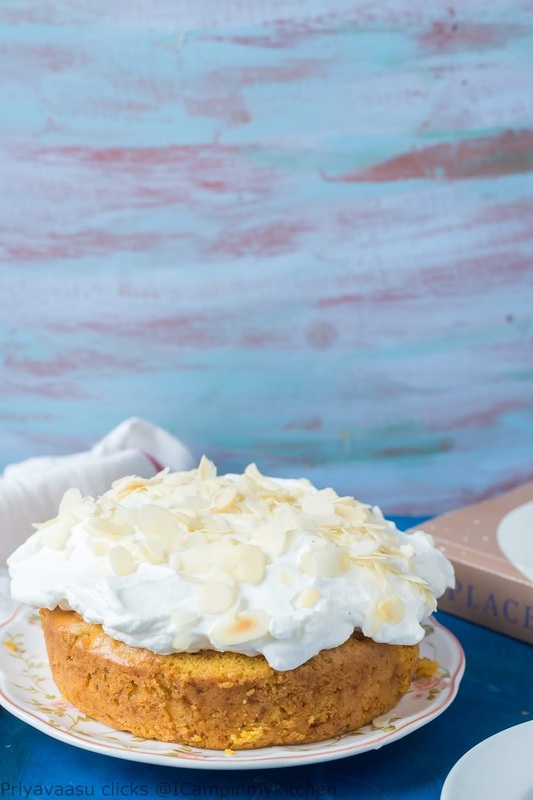 With some almonds for a crunch and beautifully topped with soft and fluffy whipped cream. 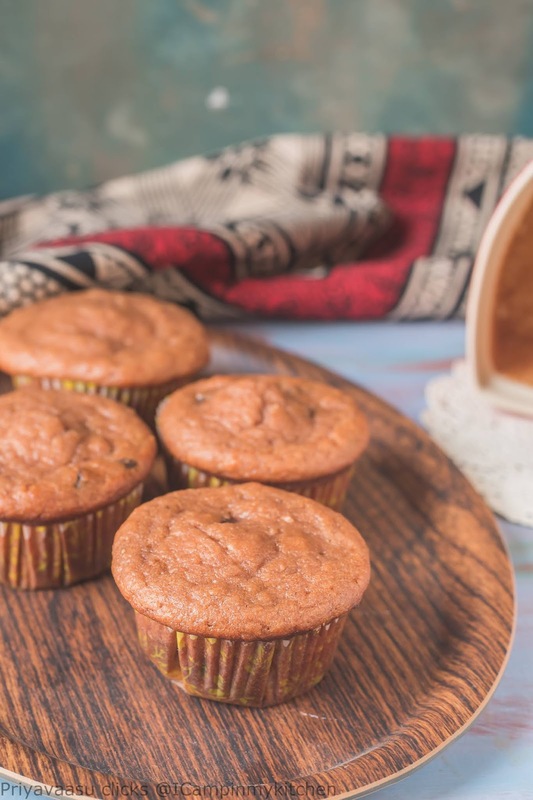 My Mango muffins were such a hit with kids, i wanted to bake a cake for them. I used the same recipe, but added milk and some warm spices and crunchy almonds to the recipe. 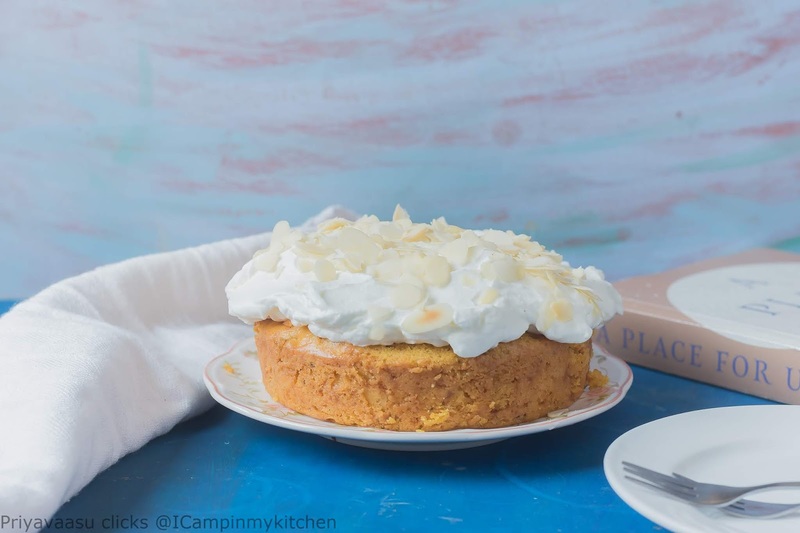 The almonds added a nice toasty crunch to the cake and the spices made it more festive and warm. I baked 2 cakes, one cake went divided for my 2 friends, who enjoyed this cake warm for their breakfast next day. I frosted the other cake with simple cream which both my kids enjoyed! 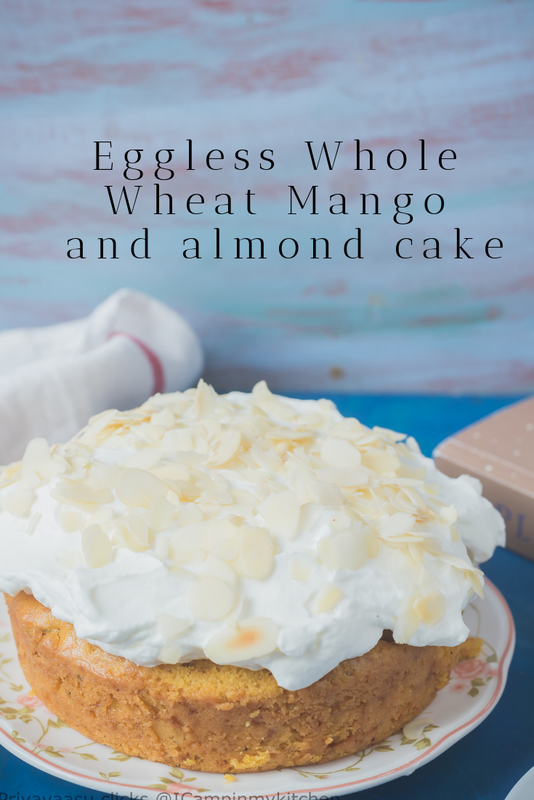 I have made this cake with store-bought mango puree, will definitely try this when i get fresh mangoes next year. 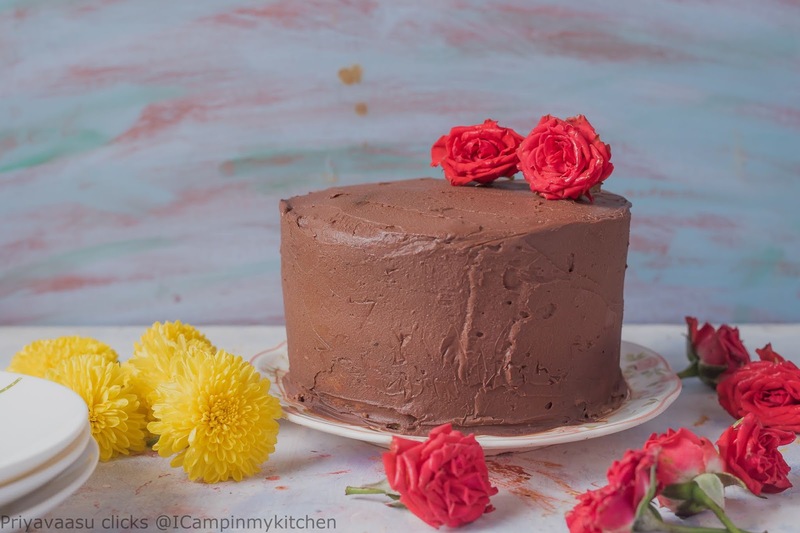 If i have to list my best 10 bakes this year, this cake would definitely amongst them. Take together cream cheese, whipping cream in a bowl, using an electric beater, whip until you see soft peaks, add icing sugar to this and whip until you see stiff peaks. Refrigerate until use. Preheat the oven to 170C. Prepare the baking pan, grease and line it with parchment paper. I used 2 5 inch pans for this. In a large bowl, take together flour, baking powder, baking soda together. Using a baloon whisk, whisk it all together. You can also use a sifter and sift them into a large bowl. To this flour mix add almonds, cinnamon powder, ginger powder, pounded cardamom, pounded cloves. Whisk this well. In another bowl, take mango puree, add sugar, oil and milk to it. Use an electric beater or whisk,whisk the contents together into a uniform liquid. To this liquid add the dry ingredients in 3 batches. Use a spatuala to mix the flour into the liquid in single direction. Do not mix vigorously. Pour the batter into the prepared pan, bake the cake in the preheated oven for 40-45 minutes or until a skewer inserted in the middle comes out clean. Remove the cake from the oven, let it sit in the pan for 5 minutes. Then slowly remove the cake onto a wire rack and cool completely. If serving without any icing, serve it warm. If planning to frost the cakes. let it cool completely. Cling wrap and refrigerate until you are planning to frost it. I baked 2 5 inch cakes, but 1 cake got over even before i could frost and click them. I simply dumped the whipped cream frosting on top of the cake, tried to level it and cover the entire cake. Sprinkled some toasted almonds and served. 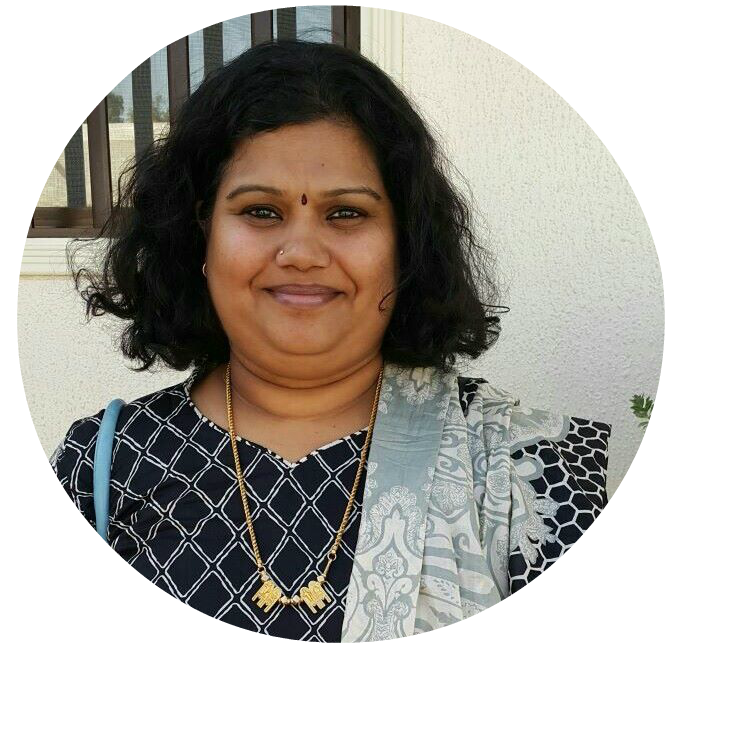 Fijian coconut buns, i have been eyeing since i saw my fellow blogger Sowmya and Priya suresh posted them. 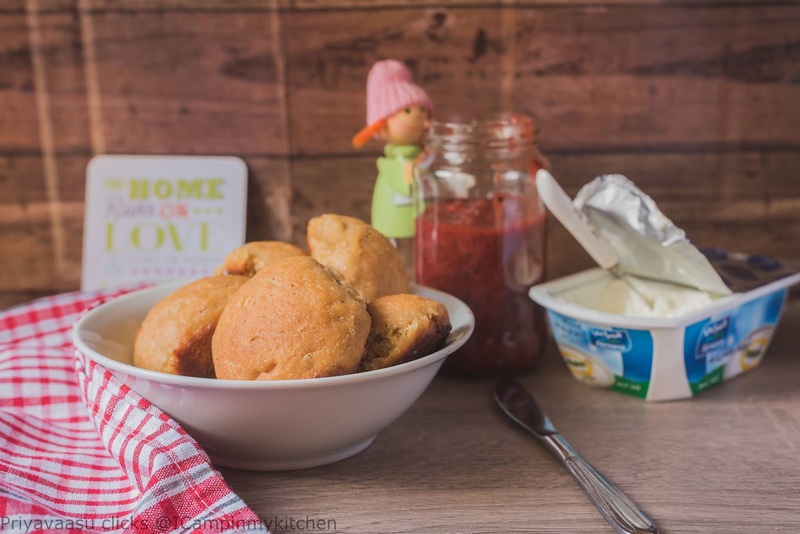 Deliciously soft buns baked with coconut milk, i immediately wanted to include them in my bake-a-thon bakes. 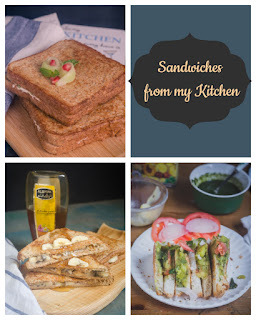 This week i was cooking from capital cities around the world. I made Pan de coco and Tres leches Cake, in that line, i decided to make these buns as the final dish for this week's bake-a-thon. I have used coconut milk to knead the dough, you can also use normal milk. When i was making the dough, i actually ran out of milk, so i used coconut milk to make the dough. It rendered a beautiful texture and flavor to the buns. The buns are drowned in coconut milk, before pushing them into the hot oven. The milk bubbles and boils when the bun is rising and baking in the oven. Your whole kitchen will be filled with a sweet aroma of coconut milk. My buns got a little caramalized at the bottom, thank god i removed them at the right time, so keep an eye on your buns around 20 minutes. 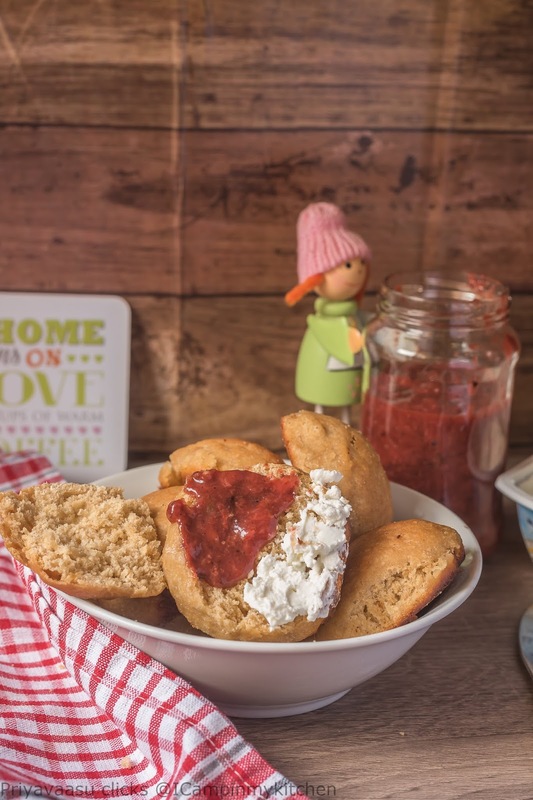 I served the buns with freshly made strawberry jam and labneh to my kids. My lil one loved it with the jam. A perfect bake to warm your breakfast table. Take flour, sugar, yeast and gluten in a big bowl, whisk them well to combine. Take milk in a microwave safe jug, warm it for 45 seconds, add butter to it. Add this warm milk to the flour mix and using a wooden spoon, mix it well. When the mix comes together as a dough, use your hands, to knead it to soft dough. If you feel the dough is dry, try adding 1 tbsp of milk at time and knead. The dough comes out pretty easily, easy to handle, knead and shape. Let the dough rest for an hour or until it doubles up in size. I left it for 90 minutes. Once the dough doubles up, punch it down, deflate it and knead it again. Divide the dough into 10 portions, roll them into buns and arrange it in a baking tray, i used two trays to bake. Let the buns sit for another 30 minutes. While the buns are resting for the second time, preheat the oven to 200C, Pour the coconut milk on top of the buns covering all. Bake the coconut milk soaking buns in the preheated oven for 20-25 minutes or until the top turn golden brown. Remove the buns out of the oven, let it sit for 5 minutes in the tray, then remove it on to a wire rack. 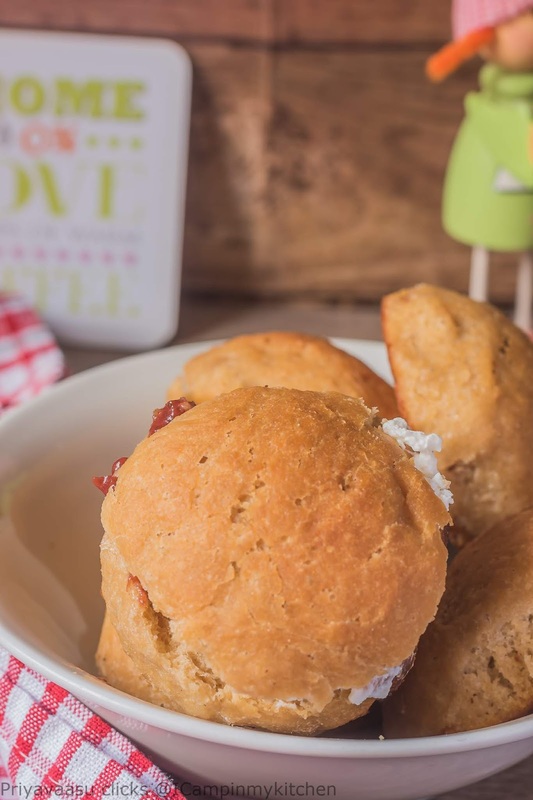 Let the buns cool, serve them warm with a blob of butter/cheese or your favorite jam. The third capital city we are visiting today is the Mexico city. When i was first looking for mexican dishes i was thinking a savory bake. So i was checking some casseroles to make. 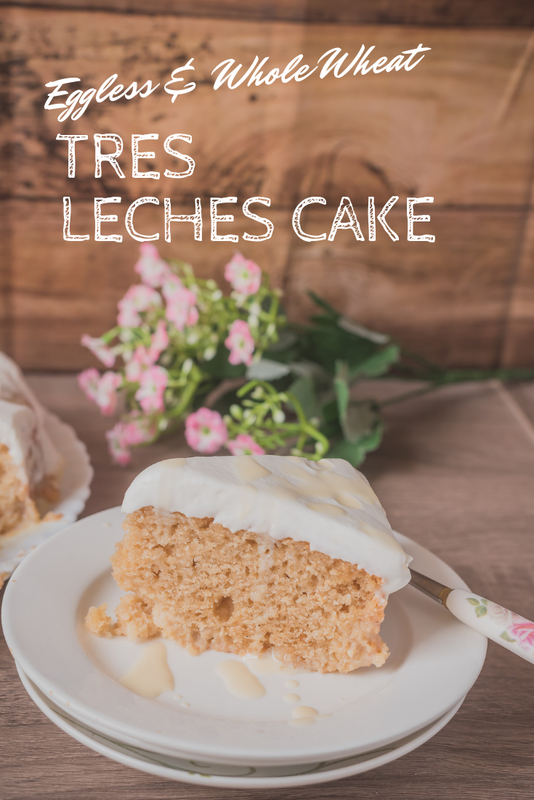 But then a sudden thought change and i checked the dessert options, then came the light bulb moment of tres leches cake. A delicious white cake, soaked in yummilicious 3 varieties of milk evaporated milk, condensed milk and whole milk. I made my vanilla cake, with a slight difference, i added some coconut flour along. 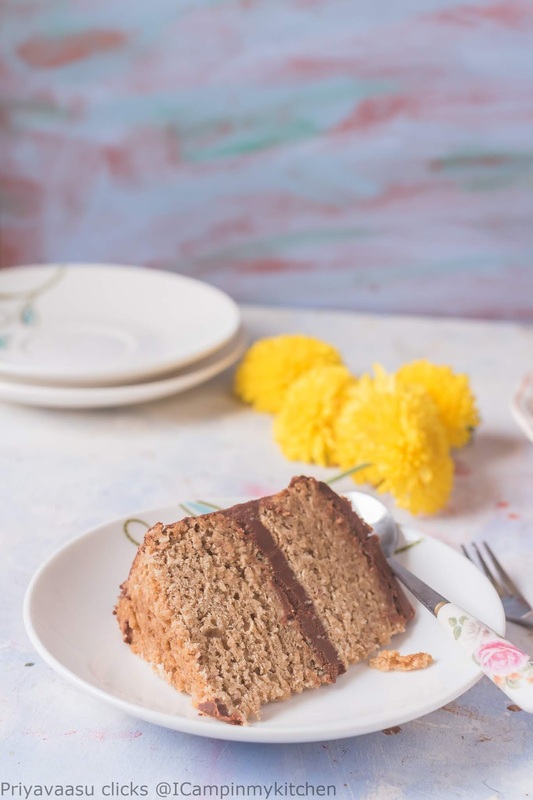 In one of the facebook groups on baking by jeyadra, i came across this tip of adding coconut flour to eggless bakes to get a better texture in the cake. i usually get a good texture on my wheat bakes, but then i wanted to try this tip and i m happy with the light texture of the cake, maybe next time i will try to reduce the flour a bit more along with coconut flour, if i get better results, i will definitely let you all know here. The cake soaked in 3 delicous milk and frosted with whipped cream was such a dreamy delight. My elder one is enjoying himself with a generous slice for the past 2 days. He gave me a 5 star for this flavor. My lil one has not even touched the cake, though he loved the soaking milk and was enjoying spoonfuls of whatever was there remaining after pouring on the cake. 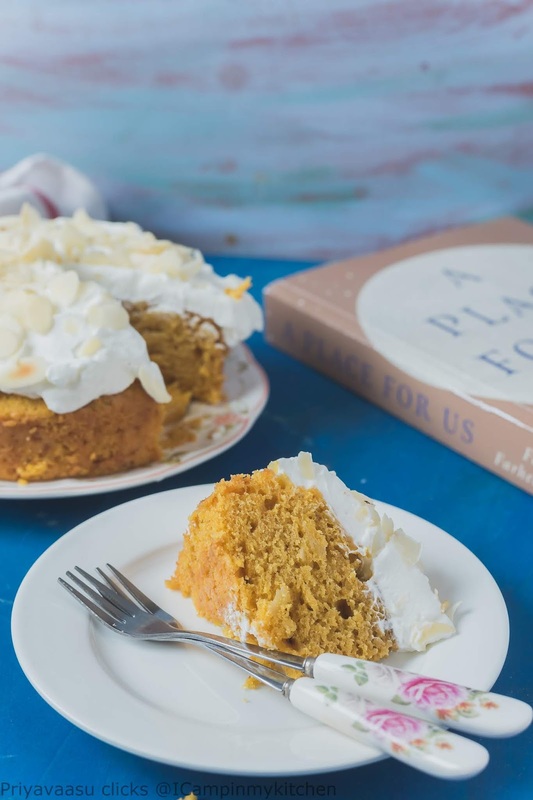 This is definitely a keeper recipe and a perfect bake for celebrations, where you don't want to do an elborate decoration on your cake. Take the cream in a bowl, whip it using an electrical beater, once you start seeing stiff peaks, add the sugar and whip another 2 minutes. Cover and refrigerate until use. Sift together flour, coconut flour, baking soda, baking powder twice in to a large bowl. To this add sugar and mix well. In another bowl, take together buttermilk, oil and vanilla extract, using a electrical beater whisk it well to a smooth liquid. To this add the dry ingredients in 3 batches. Using a spatuala, mix the flour mix in to the liquid. Do not mix vigorously. Mix in single direction, take care there is no white flour left. Pour the batter into the prepared pan, tap twice to release the air, bake in the preheated oven for 60 minutes or until a skewer inserted in the middle comes out clean. Once done, remove the cake from the oven and let it rest in the pan for 5 minutes, then slowly unmould the cake on a wire rack, let it cool down. While the cake is cooling, take the condensed milk, evaporated milk and cream together in a jug, mix it well. I used a hand whisk and mixed it smooth. 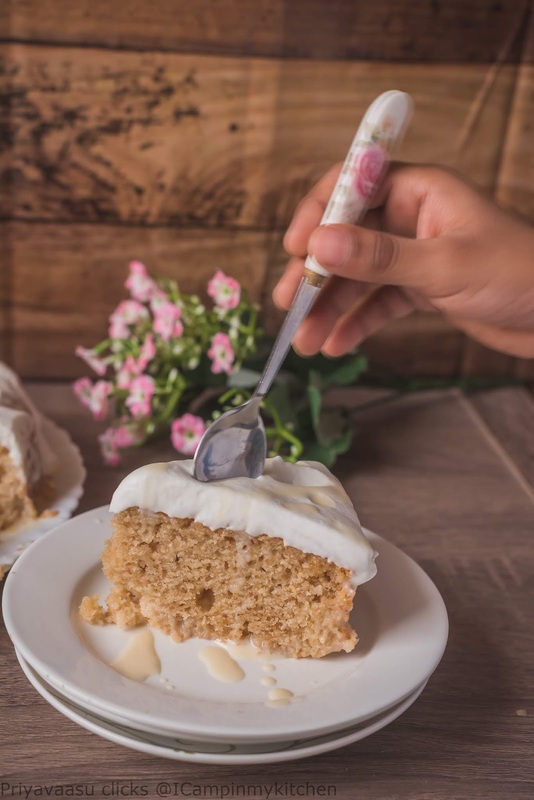 When the cake is almost cooled down, place it in a high-edge plate or a glass tray, poke random holes using a fork on top of the cake, this ensures the cake absorbs the liquid well. Pour the milk mix on the cake, make sure you pour all over the cake and also along the edges too. Let the cake sit soaking the milk for atleast 4-5 hours, i left it overnight in the fridge. You might have a problem if the cake is soaking too long in the milk, the bottom might be a stuck to the plate, so be careful while lifting the cake. I run a blunt knife to slightly loosen the cake, then transfered it to another plate. Spread the whipping cream on top and smoothen it. Slice and serve. I made the mistake of keeping the cake in a steel plate to soak the milk, so had some trouble removing the cake from that plate onto a serving plate. 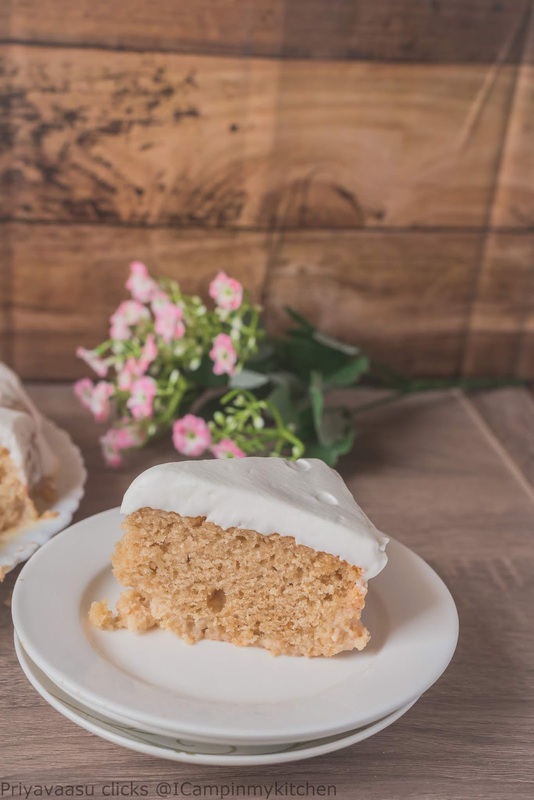 To avoid the problem of cake sticking to the bottom, you can use a glass tray, which will also be the serving tray for the cake. The next capital city i chose to cook is Muscat, capital of Oman. While looking for what to cook, i came across a newspaper article of omani breads. 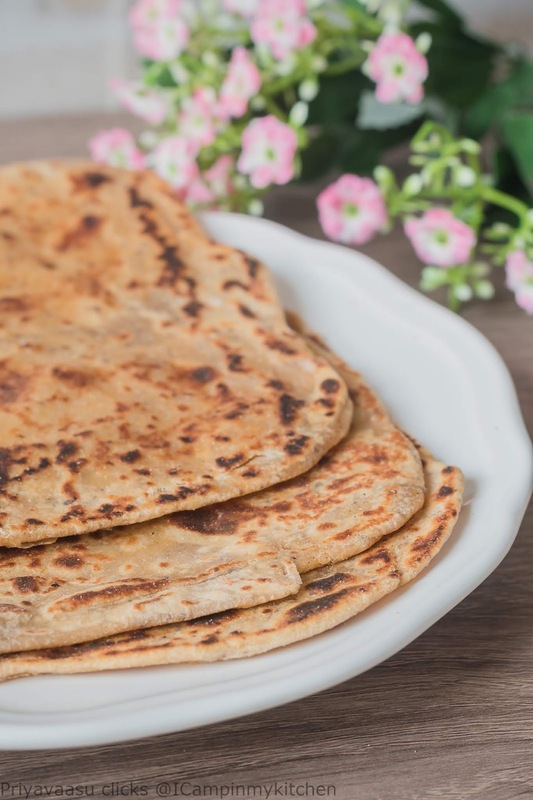 I chose to cook the soft and flaky omani flatbread Maldouf. 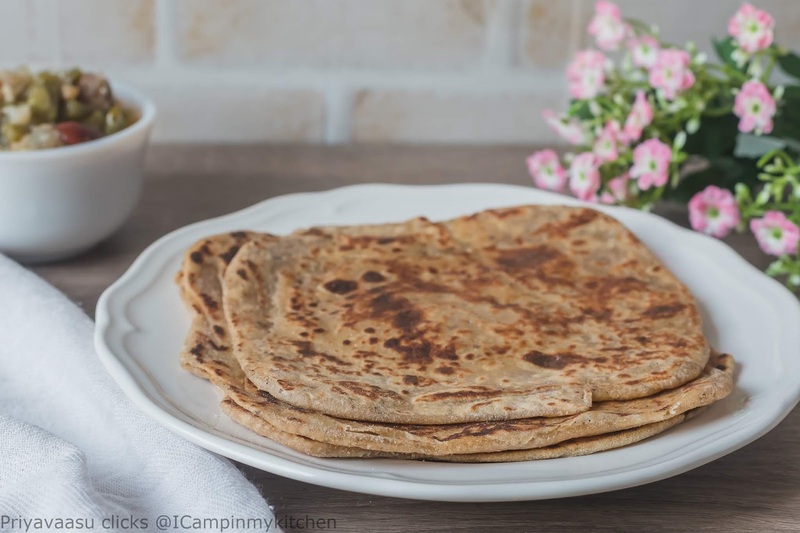 The dough is kneaded with dates puree and eggs, the bread is then brushed with fat and cooked to get those deliciously soft and flaky layers. 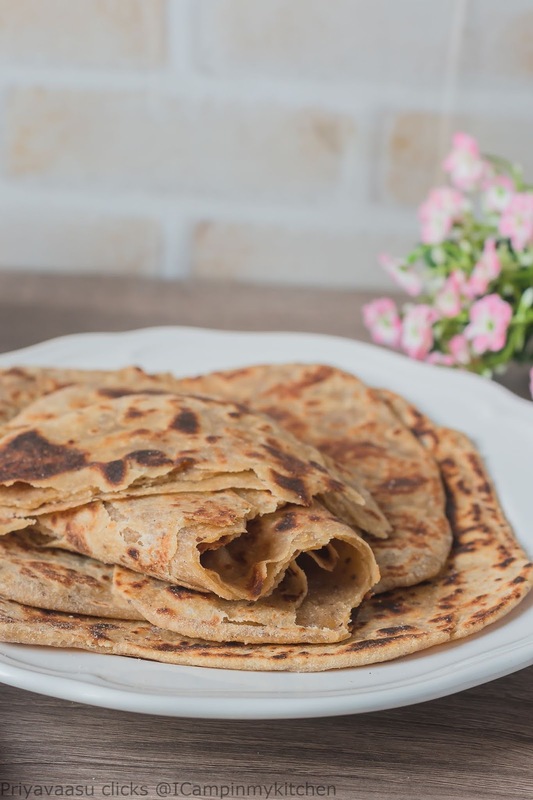 The original recipe contains eggs, which i have replaced with milk, and i have used whole wheat flour, do not worry, the dough stretches beautifully to thin layer. The bread pairs up pretty well with a spicy side. I paired it with a simple cabbage curry, spiced yogurt and pickle for my kiddos dinner. I was worried whether they would like it, but to my surprise the elder loved the combination. 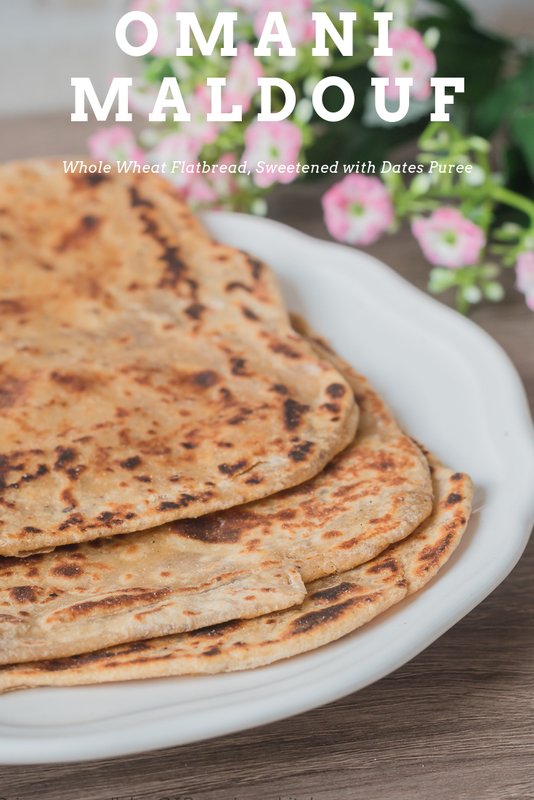 Though the bread is kneaded with dates puree, it offers only a mild sweetness to it, so when paired with a spicy side, it turns out to be a delicious combo. Take wheat flour in a wide bowl, add salt and mix. Pit the dates and blend it smooth with milk. I used by hand blender for this. 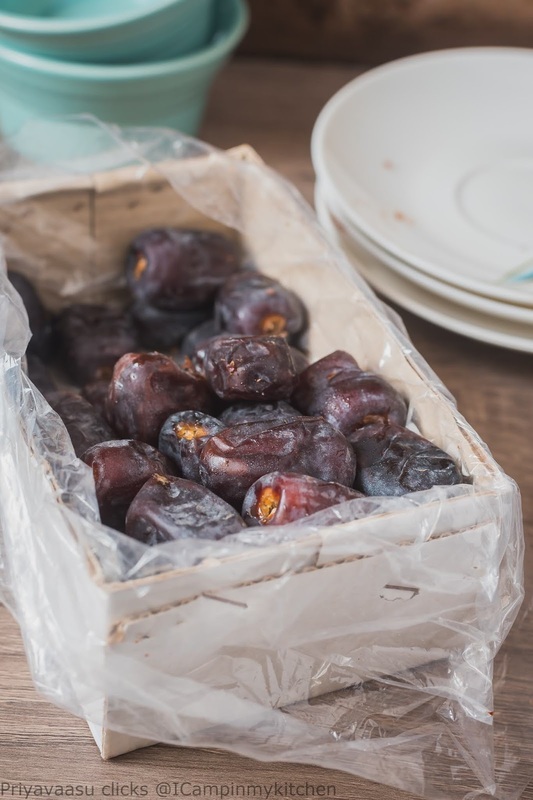 Add this smooth dates- milk to the wheat flour and knead it to soft dough, you might have add a tbsp of dough towards the end, if you feel very sticky. Once you get a smooth dough, add a tbsp of ghee and knead well again. Let this rest atleast an hour, before you start making the bread. I made the dough in the afternoon and left it to rest until evening, when i made this for dinner. Heat a tava for cooking the bread, let the flame be simmer. Divide the dough into 4 portios. Roll one portion into a thin rectangle, brush with ghee all over. fold the rectangle into a envelope and dust with flour and roll it to a rectangle again. 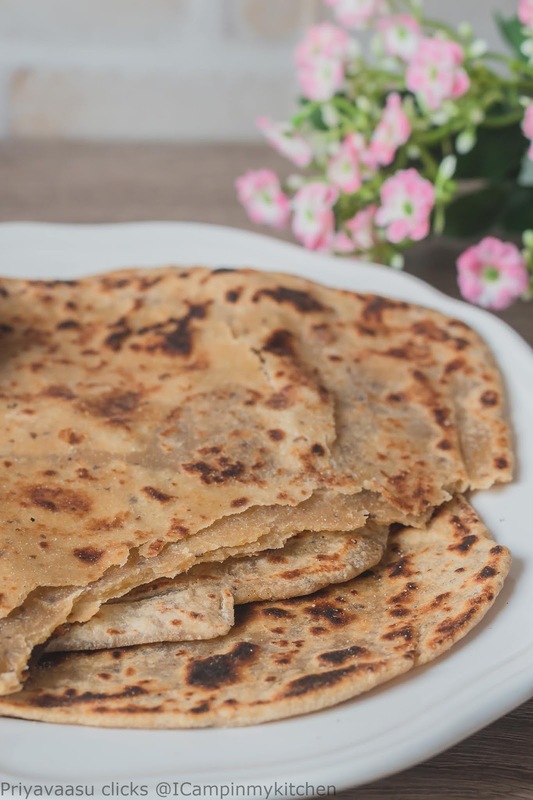 I did this step twice, once you have rolled, cook the bread on the hot tava, flip and cook both sides until brown spot appear, take the bread off the stove, brush with some ghee. Repeat the same with rest of the dough portions. Keep it covered with a kitchen towel until you serve. Serve it with some warm spicy curry to compliment the sweetness of the bread. I served with some cabbage dry curry, pickle and spiced yogurt for dinner.